This story is part of a special series on U.S. teachers' views of carrying guns and school safety. WASHINGTON, D.C. -- Forty percent of America's teachers think their school does not have adequate security to keep potential shooters out. The same percentage think their school is not well prepared to protect students and staff if an armed shooter gets inside. About three in 10 (29%) doubt their school's ability to do either. Thinking about your school building(s) and the security measures that are in place, how well is your school protected from shooters entering the school? If an armed shooter were able to enter your school, how prepared do you think your school would be to protect students and staff inside the building? These findings come from a nationwide survey of 497 teachers in U.S. elementary, middle and high schools conducted March 5-12, less than a month after a Florida high school shooting that killed 14 students and three staff members. In the wake of the shooting and the demonstrations that followed, Americans' support for stricter controls on gun sales has climbed to its highest level since 1993. Though 60% of teachers say their school is protected from shooters being able to enter, only 9% say it is "very protected," with the other 51% describing it as "somewhat protected." 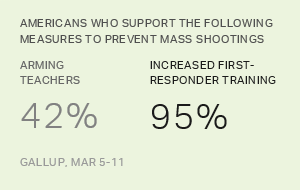 Similarly, 14% say their school is "very prepared" to protect students and staff if a shooter gets inside, with 46% saying it is "somewhat prepared." Elementary and middle school teachers are more likely to think their schools are very prepared if a shooter gets in the building (21%) than are high school teachers (6%). The possibility of a school shooting does not appear to be creating intense concern among U.S. teachers or their students. The percentage of teachers who are very worried is in single digits (9%), with another 27% somewhat worried. About the same percentage of teachers (8%) say their students are very worried; 37% say their students are somewhat worried. How worried are you about being the victim of a school shooting? How worried are your students? Perceptions of how well the school is protected do not appear to be linked to teachers' worry. Even among teachers who think their school is not well protected from keeping a shooter out of the building, most (61%) say they are not too worried or not worried at all. The same is true for teachers who think their school is not well prepared to protect them or students if a shooter gains entry -- 60% do not worry much about being a shooting victim. Elementary and middle school teachers are more likely to be worried about being shot (46%) than are high school teachers (24%). In contrast, high school teachers are slightly more likely than elementary and middle school teachers to report that their students are worried, though the difference is not statistically significant. Teachers report that school shootings are not a common topic of discussion among students or their fellow teachers in their school. While one out of five say teachers talk about shootings a great deal or a lot, the majority -- 57% -- say their fellow teachers talk about the possibility of a shooting at their school a little (44%) or not at all (13%). Sixty-four percent say their students talk about it a little (46%) or not at all (18%). How much do the teachers with whom you work/do your students talk about the possibility of a shooting occurring at your school? There is a clear difference by age in the amount students are talking: 45% of high school teachers say their students are talking about it at least a moderate amount, compared with 28% of elementary and middle school teachers. The school shooting at Parkland, Florida, on Feb. 14 revived memories of previous mass killings at schools in the United States and sparked a nationwide grassroots push for measures to prevent such tragedies in the future. Fierce political battles in Congress and the Florida legislature have produced legislation that includes some actions aimed specifically at strengthening schools' defenses against shooting attacks. Measures that truly make schools safer will be welcomed by the nation's teachers, who are in the line of fire when such attacks occur. As it stands now, many do not feel their schools have enough security to keep shooters out or have adequate protections if the shooters get in. In spite of their lack of confidence, however, it appears that the latest tragedy has not thrown most schools off track, as most teachers report that neither they nor their students are overly worried about the threat of an attack at their school. Results for this Gallup poll are based on interviews conducted via a web survey March 5-12, 2018, with 497 U.S. teachers who teach grades kindergarten through high school. The teachers are members of Gallup's probability-based national panel. For results based on the total sample, the margin of sampling error is ±7 percentage points at the 95% confidence level. All reported margins of sampling error include computed design effects for weighting.